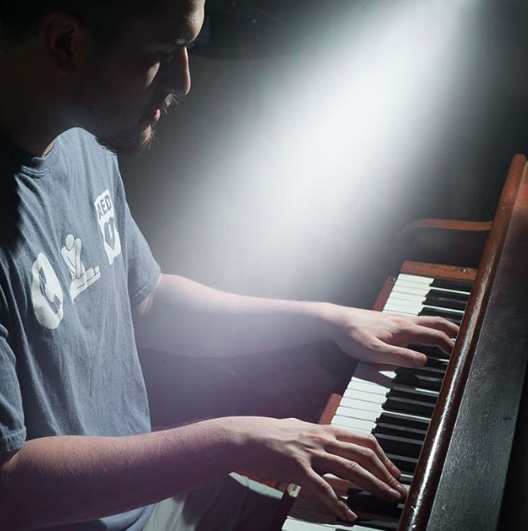 "Every time someone plays Autumn Leaves, an angel loses its wings"
The twenty four year old is from Toronto, but currently lives in Montréal, where he teaches piano and does applied ethnography. Like so many of us, he finds social media artificial and deceiving. But that never stopped him from creating high quality political memes that have garnered him a loyal following. A friend of mine first showed me his Facebook page two summers ago. Back then, Deathnography had under two hundred likes. He is now followed by over thirty eight thousand people. This brings me great joy because his account has everything you could possibly wish for. 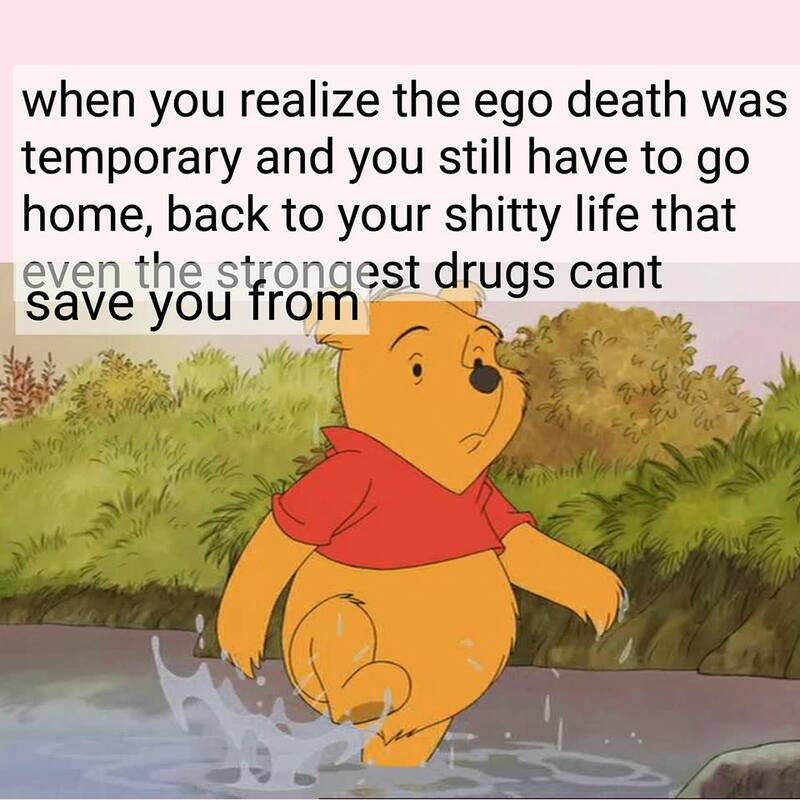 Where else can you find cogent commentary on imperialism as well as memes featuring Benedict Anderson or Winnie the Pooh and the ego death? Many of you may be familiar with his classic Monsters, Inc. post. That was "one of my earliest memes," Deathnography informs us on Instagram. "It was stolen by big accounts which cropped out my watermark before reposting. I was devastated." Fortunately, he is now receiving the recognition he deserves. Deathnography takes all of his responsibilities very seriously. He’s currently doing research into gray market television consumption for a non-profit - looking at semi-legal ways of watching TV, especially for those using streams and Android boxes. "Failure is days and weeks spent not improving or making something happen,” he tells me. “Also working selfishly and not engaging with the masses." Deathnography also features a decent amount of Canadian content (even if it's not all Positive Vibes Only). The twenty four year old loves the Pacific Northwest in the summer, incense, and the feeling of relief when he beats back an anxious thought. "I spend a lot of time in my apartment but I like to go to parks often, and there are some lovely ones in Montreal," he tells me. His parents are both landscape architects so he appreciates a good park. He reiterates that young people need strong and healthy communities. When I ask him what he does to get out of a funk, he replies, "The only funk I care about is winning chess games and paying rent." We agree that it's not easy to find a way to pay the bills reliably. "Capitalism has forced me into some terrible jobs," he laments. "The most recent one was at a fruit and veg market. I was pushed to my limit by abusive employers until I had to quit due to medical issues." RS: What is it that you do? @deathnography: I play music and chess, do anthropology, and lift weights. Anthropology for curiosity's sake, chess for the thrill of competition, music to say something, lifting weights to shut myself up. RS: You cite language and “your inability to communicate” as a source of constant frustration. @deathnography: I speak English and broken French and broken Cantonese phrases. I find that music closes the gaps in a lot of places. This isn't to say that music is simply some monolithic universal language - it is multiple tongues. But I'm better at learning these than spoken languages. RS: Best concert you've been to? @deathnography: Chelsea Wolfe in Toronto, 2016. Incredible vocalist and otherwordly stage presence. RS: What are your favourite songs to play on the piano? @deathnography: I play lots of pop covers. The Beach Boys are my favourite band of all time and Brian Wilson is my hero. I’ve been working on a cover of Surf’s Up from SMiLE. RS: What are the most important elements in your work? @deathnography: Aesthetic coherence used to be a concern but at this point I'm mostly looking to communicate core ideas as clearly as possible to as large an audience as possible. I like to be succinct though I sometimes fail. RS: Do you ever struggle with time management? @deathnography: My main challenge is forcing myself to take the proper amount of time to finish a project. I always either undershoot and put out sloppy work quickly (not an issue on a meme page) or spend too much time obsessing over details and never finish a project. RS: I feel that! Is there anything you wish you were exposed to at a younger age? @deathnography: I wish I had healthier friendships, more time spent with people of other generations, more perspectives. It's hard to get your bearings if you're only hanging out with people in your classes at school. It's a microcosm and it's not healthy. RS: Something that people never believe when you tell them? @deathnography: I have a way of making things believable. RS: What do you find romantic? @deathnography: Films. I'm a sucker for the corny stuff - the too-perfect formulas, heartbreaks, and redemptions. RS: What are some of your favourite films? @deathnography: La Haine, 2001, NxNW, Love & Mercy. RS: What's your favourite Disney movie to critique? @deathnography: My critique of A Bug’s Life, which I made back in 2016, was quickly stolen and remade a million times over. The movie is interesting because on the surface it can be read as revolutionary - and it is - but is also reactionary. The grasshoppers are leeching off of the ant colony and the labour of the ants - the ants rise up and defeat the grasshoppers. 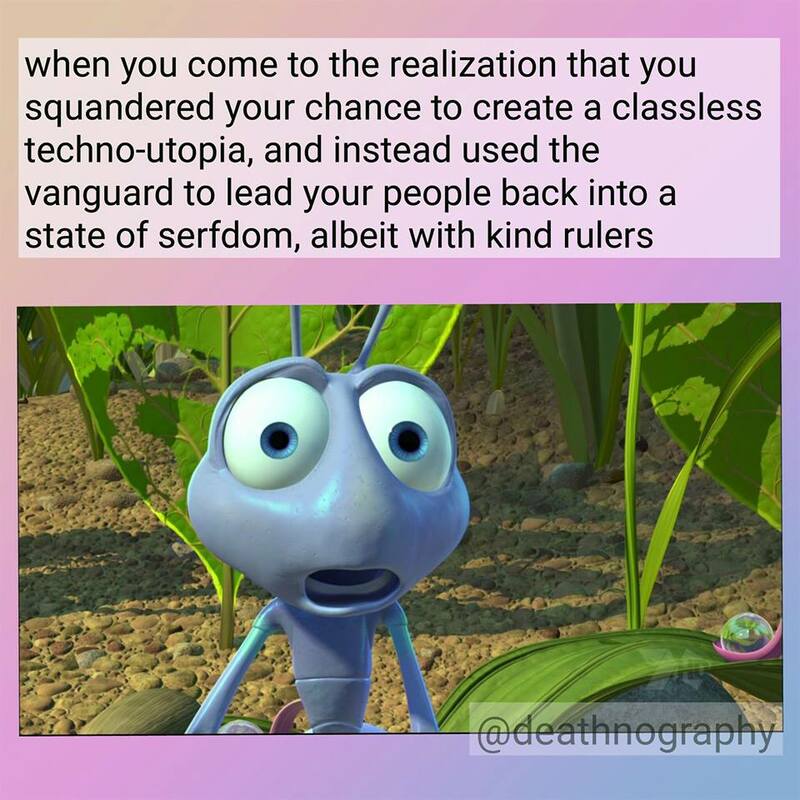 But in its conclusion, the society of ants falls back into feudalism rather than becoming a worker’s state. The monarchy is intact, and the ants continue to labour for the queen (albeit with new labour-saving technologies). What has taken place is a resolution of the ant society’s first principle contradiction - the anti-imperialist struggle against the grasshoppers. But the class antagonisms within ant society remain. The lords still exploit the serfs. 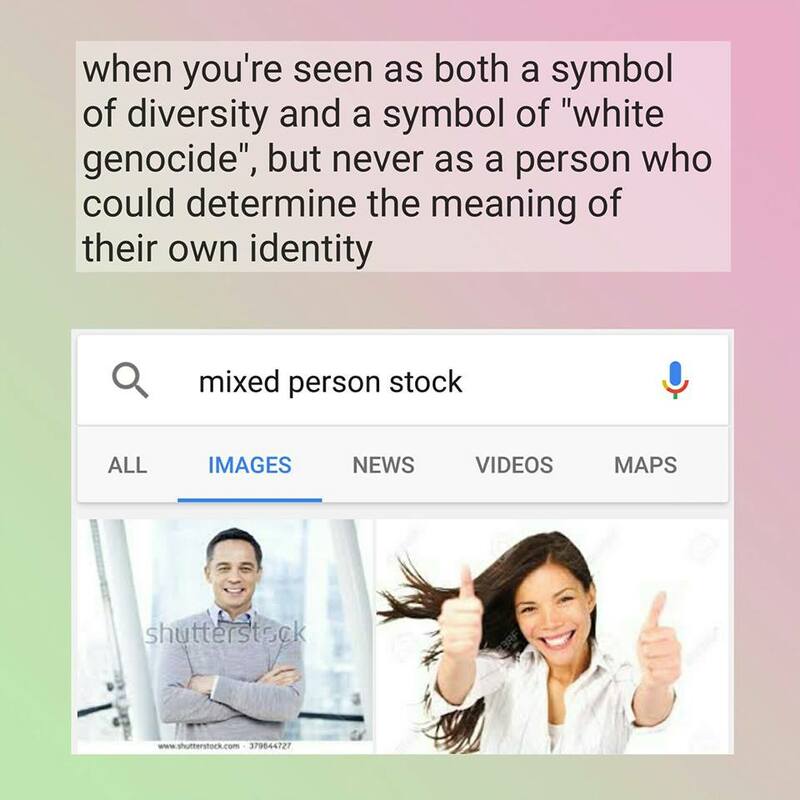 RS: How have your memes changed over time alongside your political views? @deathnography: A shift from anarchist to Marxist content occurred while I was I'm grad school reading theory and organizing. RS: What do you do when you find yourself among people who want to pander to moderates? @deathnography: So many self-styled revolutionary types get caught up in ideological purity. I don’t think of working with people who aren’t revolutionaries as pandering, just a necessary part of politics. I take a Maoist viewpoint on this - you need to work to bring up other people’s understanding of class struggle, and meet them where they’re at. Only the most reactionary individuals should be isolated or condemned. That’s a last resort. RS: How does fieldwork work? @deathnography: Fieldwork is leaving home and pretending you don’t know anything, then coming home and pretending you know something. 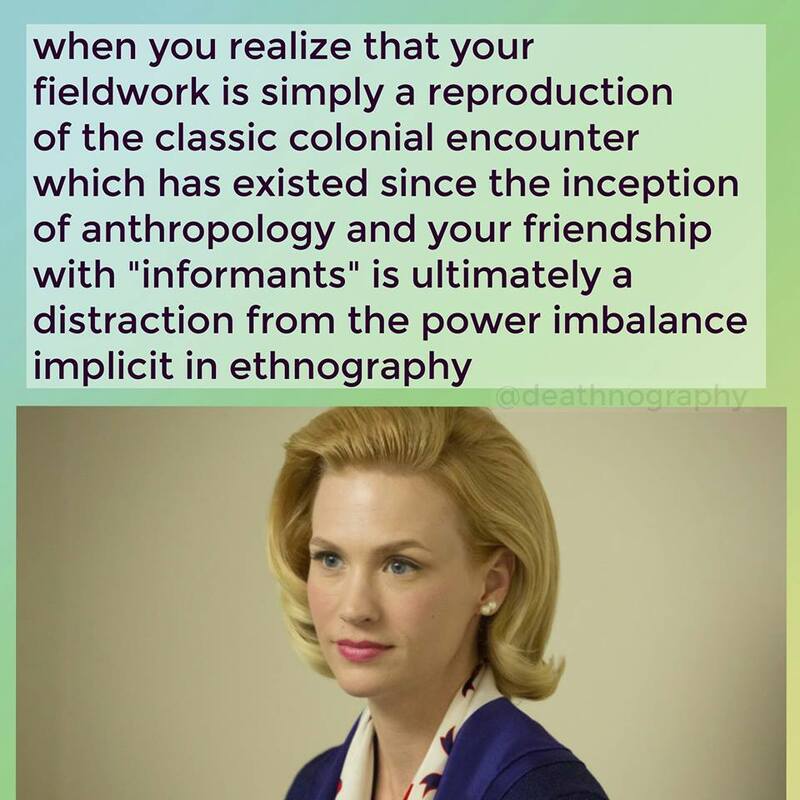 RS: In your Betty Draper meme, you commented on the possibility that fieldwork is simply a reproduction of the classic colonial encounter which has existed since the inception of anthropology. Can you comment further on this power balance implicit in ethnography? 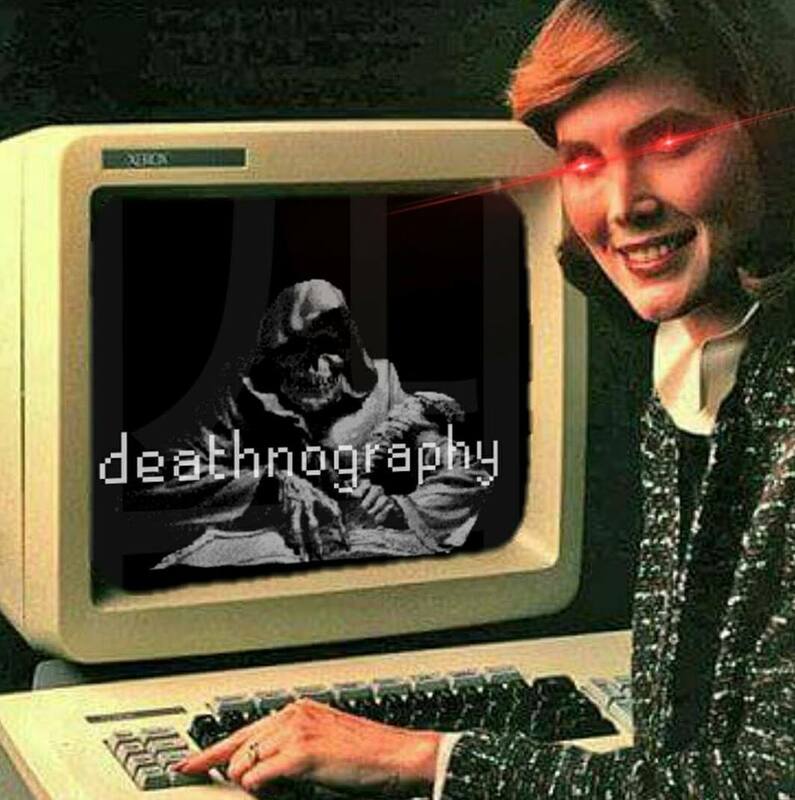 @deathnography: Anthropology has been critiqued as a neocolonial relationship where bourgeois researchers from imperialist cores going out and studying the subaltern. There is some truth to this, though others would argue that there are ways of mitigating the inherent power disparities in this relationship. And then the counter-counter-argument is that these ways of mitigating power disparities amount to lip service in the name of an empty decolonialism. The meme was a response to a blog post grappling with these arguments. RS: What's the scariest thing you've ever done? @deathnography: Went to Hong Kong alone as an undergrad to do field research with virtually no support from any supervisor and no contacts in the field. I suppose Hong Kong is my familial homeland but I didn't grow up there. My fieldwork in Hong Kong made me realize the importance of working with workers and fighting for the working class. RS: So you took frequent trips to this city. What happened? @deathnography: Immersion with the domestic migrant activists there changed my perspective on capitalism, organizing, and art. I came to understand the violence of capitalism, and how organizing and art can give us our souls back as a community. I also understand how crucial it is to form international links of solidarity. The revolution is worldwide. RS: What activists there should people look up? Indonesian Migrants Network (JBMI) - the main alliance of Indonesian migrant activists consists of over 70 sub-orgs, including the Indonesian Migrant Workers Union (IMWU), and Asosiasi Buruh Migran Indonesia di Hong Kong (ATKI-HK). These groups provide essential services and support for migrant workers, and do considerable consciousness-raising efforts amongst the masses. MFMW - the Mission for Migrant Workers works to provide legal aid and other services, including women’s shelters, to migrant workers in Hong Kong. I’ve worked with them for some years. RS: What psychs you out? @deathnography: Thinking about how old I'm getting, and how satisfaction is always fleeting. RS: Satisfaction is always fleeting. When was the last time you felt satisfied? @deathnography: This past weekend in Toronto I was happy, spending time with family and sharing good food. It's hard to be mad at dim sum.